So, if you don’t “keep up” your garden, the inevitable is that the weeds WILL take over! They will crowd out any good seeds you have painstakingly planted and choke out the brave plants that have come up already. It’s up to us gardeners to prevent such bad things from happening to our gardens. After all, we put a lot of hard work into planting, planning, watering, weeding, harvesting and processing. A lot of blood, sweat, and tears. If you are a gardener, then you know what I’m talking about. And if you don’t, let me give you an idea. And don’t get me wrong, even though gardening is not always easy, I still LOVE it! After carefully planning where you will plant, you have to get the soil ready. That takes a lot of time, and wait—time? What time? Like seriously, gardening is something that we have to MAKE time for. *winks* Yes, even amongst the busiest of schedules. I’m getting ahead of myself here. Before you do anything, you have to wait for the last frost. And where I live, you never know when that is. It’s a gamble. But really, the weather always is. For gardening, for haying, and for the horses! Anyway, once the ground is ready, then you have to plant your precious seeds, or transplant your precious plants that you have started inside the house to keep them safe from the cold. You dig the trenches for potatoes, you hill the ground (which in our case is clay) for squash, you make a trellis for cucumbers, and you get tomato cages for tomatoes, etc. All the while battling the heat and bugs! As you step back after a long days work, you admire your handiwork. You can already see the fresh fruits of your labor being enjoyed at your family’s table. You take pride in your young garden. That is, until the enemy comes in the night. Ya, so, I think you get the picture! We all can relate in the fact that nobody likes weeds in their gardens. WEEDS ARE A PROBLEM! It's so hard not to get overwhelmed at the amount of weeds that grow in a short amount of time. When I arm myself with gloves, some water, and gardening tools, I'll look down the row of onions, preparing myself for the battle of the weeds. Kneeling down on my knees, I know that I will have too pull each weed, one weed at a time. It will be slow progress, but it it will be progress, nonetheless. Even though the weeding processes is hard, it IS necessary to get the harvest that we want. We have weeds in our life. Our enemy, Satan, puts those weeds in our lives to crowd out and chock our good seeds and plants. Looking at our weeds (different for all of us) we often get discouraged by their number. It is so easy to want to give up and go inside to the cool air conditioner, but in the end we have to stay out in the heat, deal with the bugs, and weed the rows in order to get a harvest. We have to endure through the battles we face each day. We have to kneel down on our knees. God will help you pull each weed one at a time. Things might be slow, but don’t give up, slow progress is still progress. Weeding our lives is not going to be easy, it might hurt, but it IS necessary. You are not alone in your weeding process. Whatever you are going through, God is with you always. And then, as you tend and care for the good plants in your life, they will grow strong, giving you fruit of the harvest. 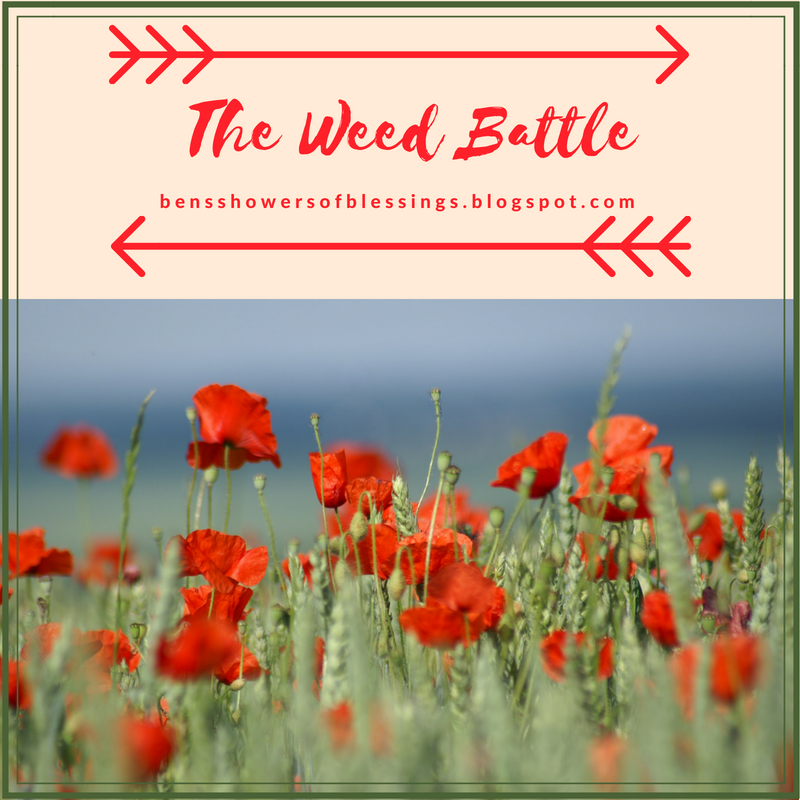 Never give up, keep on fighting the battle of the weeds! Do you like to garden? What is your favorite plant to grow? 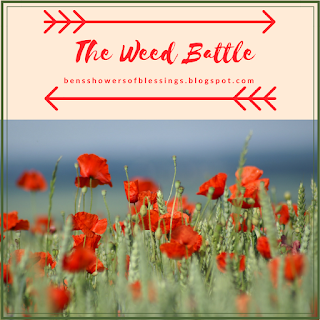 Have you ever battled with weeds in your garden? How about in your life? What has God been teaching you this week? Lets chat in the comments below! I have a garden and it produced well/ Unfortnatly it got into direapir and as it was my first attempt, a LOT of things went wrong. My first problem was not spacing plants properly . They were too close together and that was worse than the weeds! Second problem was weeds. Third problem was poor msintence. My sister did the maintaining for a long time due to my school, but when she started doing usmmer caamps, things colapsed. the hird problem is it is in the middle of our yard. Our yard is nothing but weeds so ya, the garden itself doesnt have all that many weeds around it, but a unkept lawn has resulted in weeds surounding it. GOOD NEWS: It did produce a LOT . Still is producing. Gardening is hard work, but it's definitely worth it! We had a garden but one our kitty we kept catching her eating it and a Strom kiled the ones the were still alive. But I like growing carrots. wow! I really liked the "kneeling down on our knees and letting God weed our lives". that was really clever! did you think of it yourself? Thank you for this encouraging post! You're so right, God is with us always! Thanks for reading, Livvy! I'm so glad you were encouraged by this post! Welcome to Showers of Blessings, and thank you for following!! !